Experience the exquisite sights and flavors of France and Italy on one of our personalized wine tours by Wine Tours Inc. Our regional wine tasting and vineyard tours are perfect for a sophisticated and relaxed vacation or honeymoon. In business for more than 20 years, we are a trusted tour company and we are a member of the French Tourist Board Organization, "Atout France." Wine Tours Inc. offers gastronomic and oenological tours to the French and Tuscan wine regions including: Loire Valley, Cognac, Burgundy, Bordeaux, St-Emilion, Pauillac, Beaujolais, Cote du Rhone, Provence or Champagne. 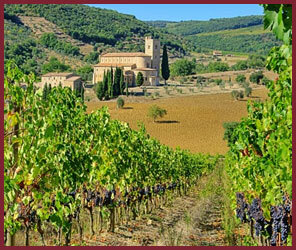 Wine Tours Inc. offers you the ultimate 5-star experience. • Travel packages include accommodations, meals, visits to vineyards, and chauffeured transport. • Tours for private parties can be arranged. • Golf and wine tour combinations are also available upon request. • Professional tours for winegrowers, restaurants, wine wholesalers, etc. are available. • Experience the once-in-a-lifetime VIP gourmet tour of France and Italy's most beautiful wine country. Wine Tours Inc. represents the ideal mix to offer the sophisticated American Gourmet all the joys and pleasures of a gastronomic table combined with an extraordinary "millesime". Ask us about how you can obtain a FREE TOUR. We provide additional offerings including other wine regions, cooking classes, olive oil and cheese tasting, and other amenities upon request. Our French and tour partner and team are multilingual which includes French/English, Portuguese, and Spanish. They also have a deep knowledge of France's history and culture and have 20 years of experience in the wine industry. Wine Tours Inc. is personal and flexible. All tours can be tailored to meet your personal tastes, needs and budget. Thank you for your interest. Please contact us via phone or email or fill out our contact form and we will get in touch with you soon.